Although strongly associated with the southern states of America, the Crape Myrtle can, with the right care, thrive in cooler more northerly areas as well. 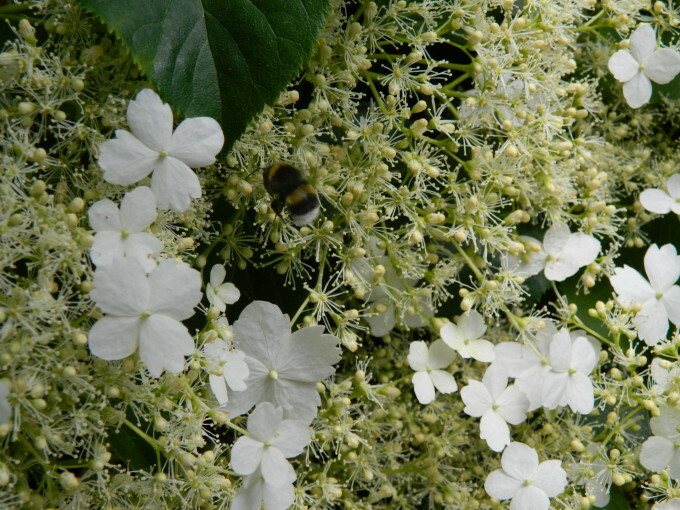 Climbing hydrangea ticks all the boxes! Did I mention we’re building a two storey extension on the side of our house (see Nature not Nuture)? It means we now have a big, beautiful blank canvass of a wall which I would like to adorn with some appropriate plantage. After much consideration, research and nerve mustering, at last I have taken the bull by the horns – or should I say, the shears by the handles – and topiarised our handsome two metre tall (and rapidly growing) Cupressus tree! Just when we thought we had finally finished garden design at the Villas, I had a change of heart about Zone 2 (previously known as the Secret Garden). We simply love the Elder. This fast growing hedgerow plant with its heavenly fragrant flowers and dark purple berries is not only pretty, but also useful. How to keep patio plants pot-happy!